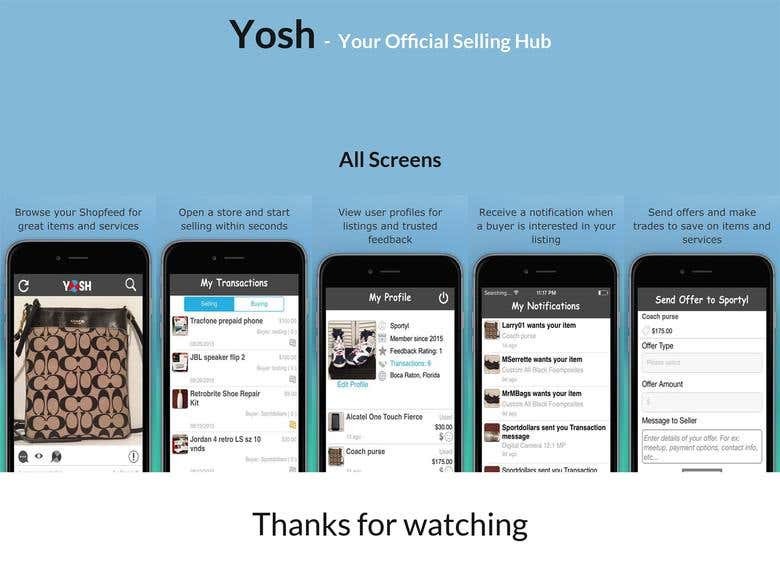 Yosh is an online marketplace that gives users the ability to buy, sell and trade with each other socially. Post your items and services for free with Yosh. Your Official Selling Hub - Make cash selling your products and services. - No Fees to list and sell your items and services. - Earn your feedback rating and gain reputation within the community. - List your item or service within seconds. - If you offer a service such as a technician, barber, mechanic,etc you can list it to gain exposure in your area or nationally. - List new and pre-owned items in many different categories such as books, clothing, electronics, video games, and more. Your Official Shopping Hub - Browse the shop-feed for great deals in various categories like antiques, auto parts and accessories, books, clothing, electronics, video games, services and more. - Make an offer to a seller in the form of cash and/or trade. - Browse your shop-feed by most recent listing or sort by category.